this OSSSC Recruitment Notification 2018. Female and Male Candidates who are interested and having necessary physical standards they can apply online for this OSSSC Excise Constable recruitment 2018. Online application link will be active from 12-10-2018 to 12-11-2018. OSSSC official website to submit application form online is www.osssc.gov.in. 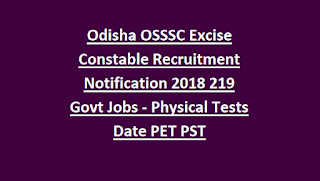 Candidates selection for this OSSSC Excise Constable recruitment will be through Physical tests (PET/PMT), Written exam. OSSSC Excise Constable Jobs minimum qualifications is 10th pass. 73 posts are reserved female candidates. 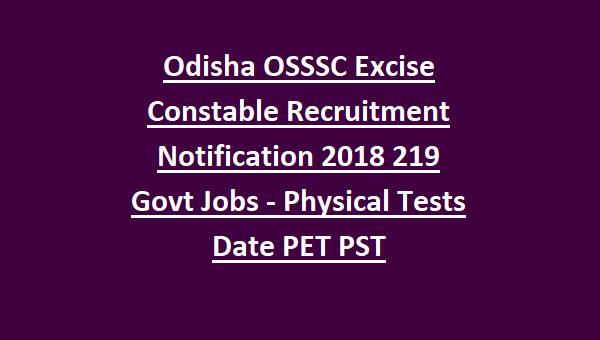 District wise vacancies, category wise vacancies, Exam Pattern and syllabus, Physical Standards Tests, Physical endurance Tests, how to apply online, Exam Syllabus pdf, excise constable running test details for this Odisha OSSSC Excise Constable Jobs Recruitment Exam Notification 2018 is given below. As on 01-01-2018 candidates age limits are 21-32 years and age relaxations for SC/ST/SECBC/Women/Ex Serviceman candidates 21-37 years. 10th pass candidates are eligible to apply online for these Excise Constable jobs. Must have studied Odia language up to 07th class. For all candidates application fee is Rs.100 to be paid through Government Treasury under Head of Account- “0051-P.S.C.-104-UPSC/SSC-Examination Fee-0047-Fees collected for conducting Examination by OSSSC-02213”. Candidates selection will be held in three stages. Total selection will be held for 100 Marks for this Excise Constable jobs. The above given information is qualifying nature of PET tests. Candidates must have secured good score in Physical Tests. Marks of Physical Tests considered for preparing merit list. For PET Merit score refer the official notification. Merit in PET will be give you a good chance of getting the job. PET marks and written exam marks are considered for preparing final merit list. At first PST Physical Measurements Tests and then PET conducted. Qualifiers of PET Physical Events Tests only get eligible for OSSSC Excise Constable jobs Written exam. Candidates who qualified Physical Standards tests and Physical Endurance tests they are only eligble for written exam. Excise Constable Written exam will be conducted for 60 marks. Written exam is OMR Based pen and paper exam. Exam Pattern is objective type only. Exam Duration is 2 hours. Total 120 questions will be given and each question contains 0.5 mark. Exam Syllabus for these Excise Department vacancies is 10th class level only. Interested, good physical fitness having candidates can apply online for this Excise Constable vacancies from 12-10-2018 to 12-11-2018. Official website to apply online is www.osssc.gov.in. Candidates must have provide original and valid information. Start practice for Physical Tests. Remember you must have get good score in physical tests. A good score in physical test will give you an opportunity to grab the excise constable job. For exam syllabus buy a good book from your nearby book store. You have to gain good knowledge on Excise matters related to Odisha sate.